This is the 4th exact rug I have bought so far. I am in awe of the beauty and Quality of this rug. On sale, it is worth every penny. I get a lot compliments from visitors and friends. When I tell them where I purchased it and how much it costs. No one believes it. Beautiful, beautiful. Safavieh Handmade Heritage Traditional Heriz Red/ Navy Wool Rug - 7'-6" X 9'-6"
Dimensions 9 ft. 6 in. x 13 ft. 6 in. I bought this rug two years ago for our living room. The colors are gorgeous; lots of them but subtle. The colors would blend well with reds, blues and greens. This rug never shed. One of the best things is that the pattern hides everything; dirt, toys, cat hairballs. I have two little kids and sometimes it's hard to find lost small toys on this rug. So even when the rug needs vacuuming, it still looks clean if I'm surprised by visitors. The style is definitely traditional which works well with our 1930s home. Overall I'm very pleased with the quality and durability of this rug. This is a great rug! I pause nostalgic about it. I am sorry to have to replace it BUT I am buying the same rug over again. I purchased this in Dec 2008. It has endured hard use every day in our great room., surviving dogs, cats, kids, grandkids and the daily use of children's wheel chairs. We have spilled on it, neglected vacuuming, and the constant ash and wood chips from our wood burner. We just got a new couch and I noticed that there is a balding spot in the rug. It is where my son's lugged tires on his wheelchair sit so I guess I will put a pad on that spot when the new rug comes. I know that the new rug will shed badly for a while, but this rug is nearly indestructible. I will give the old one away to some lovely person who needs it. I would really miss it if I wasn't getting the same one over again. Can I say how much I love this rug and how glad I am that I can still buy it!! The rug came quickly and is of a nice quality. The border color is definitely a navy and the outermost border color is a red. It is a bright red in daylight and softens a bit in a darker room. I would not describe it as burgundy at all. There are many hues of golds and greens also in this rug and they all compliment each other well. I am using it in my dining room and it is not shedding very much so far. We like the colors, thickness and quality of this rug. We are very pleased with this purchase. My only real complaint about this rug is that the color is not as vibrant as it appears in the photo. I agree with other reviewers in that that the colors are more "rustic" than they appear in the photo. The red is more of a burgundy and the off-white is closer to beige. However, the colors still blend with my decor and it was and excellent value for a large, wool rug. Additionally, there is a lot of shedding, but I expect that to disappear after vacuuming over the next few months. 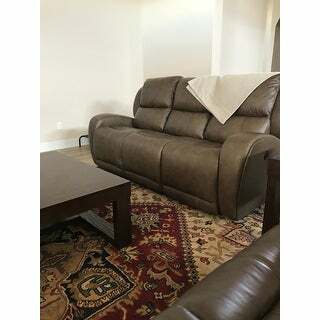 I ended up returning this rug, but purchasing the exact same thing one size smaller. My living room fireplace is at an angle, which I discovered would push the corner of this very large, very beautiful rug out of my living room and into my dining room hallway. Overstock was GREAT about working with me to get the correct size sent to me and the one that was too large cancelled. I figured out my mistake with a measuring tape shortly after placing my order. The customer service assistant made several phone calls to the shipping department to manually override the scheduled shipment, and to substitute the correct smaller rug for my order. Considering what a big company Overstock.com is, it is really wonderful to find a real person on the other end of the phone when there is a problem, and to get personalized assistance to make sure the order is right. I love this rug, just in a slightly smaller format! This is the second rug in the same pattern / color that we have purchased. This on is a little larger than our last. It holds up well to traffic (we had our last one over 10 years). There is some initial shedding, but that is to be expected with any wool rug. Love this rug. It came better than I anticipated. It is thick and the colors are beautiful. It has shed some but cleans up nice. The colors of this rug look great with dark furniture. Colors not quite as vibrant as shown on the computer, however, they are close. This rug is a great value for the size and price. The colors in the rug are vibrant and beautiful. Highly reccomended. Absolutely beautiful! Heavy thick rug. Colors are deep red, navy blue, sage, beige, tan, gold, deep salmon, colonial blue. Very pleased with my purchase. Just ordered round to go in foyer. This area rug is absolutely stunning as is the quality. We 'just' unrolled it so are hoping it doesn't roll on top of the existing carpet. This rug is all wool and the colors are exceptional! This is a magnificent rug and size was perfect for our needs. Made of wool and soft. Any mild shedding was easily vacuumed. Works great in our sitting room. This rug is beautiful with a thick pile. It laid out nicely despite having been rolled up. This rug is in our large dining room. Spills have cleaned up quickly and easily. It's a beautiful rug and we love it. If a rug can make you happy, then this rug made us very happy. "Whats the rugs thickness? And why does it contains latex?" This rug has a pile height of 0.50 inches. Yes, this rug does contain some latex. "Do you offer this rug in 12ft x 12ft?" "I want to order a 9'6x13'6 rug. I also want a thick felt pad for under it but do not see any offered. I also want to order a 8x10 rug and a thick felt pad was offered. Do you offer the 10x 13 felt pad"
Needed an area rug for recently installed hardwood flooring in our family room. This particular rug came in several different sizes and the colors would compliment the space for which it is intended. The rug composition was also a contributing factor. I also wanted a wool rug and this particular rug fit that bill. I look forward to its arrival. 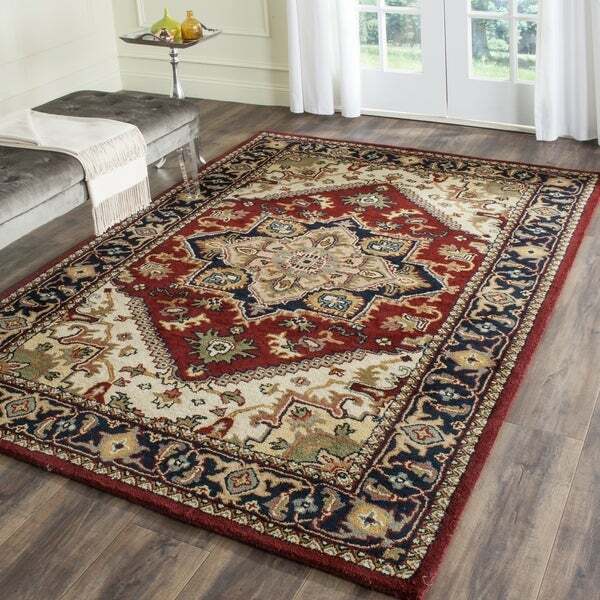 Safavieh Handmade Classic Heriz Red Wool Rug - 9'-6" X 13'-6"